For the adults in Royal 2/4 and President sea view, free access to the Wellness Center "Le Sabine Spa" (booking required) with use of the outdoor multifunction freshwater pool, cardio-fitness gym, turkish bath and relaxation area with sun beds! 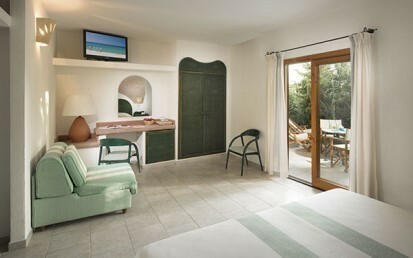 Resort & SPA Le Dune located in north Sardinia, it is an ideal place to spend your beach holiday in Sardinia. Surrounded by a 280'000 sq.m. park in Badesi, on the Gulf of Asinara, by the long white sandy beach of Li Junchi. If you wish to explore the coast, besides the several activities in the resort, Isola Rossa, Alghero and Santa Teresa di Gallura are within easy to reach by car and moreover interesting excursions by boat or to visit the Costa Smeralda are to book. The Resort & SPA Le Dune is a great family holiday village including two 4-star superior hotels and three 4-star hotels. It has a total of 4 pools for adults and 2 for children, 10 restaurants, 6 bars, a SPA and numerous common areas for relaxation, sport and entertainment. From its restaurant services to amenities for young guests, the Resort guarantees top quality standards and the impeccable service of the well-known Delphina Hotels & Resorts Group. Hotel Le Palme is a 4-star hotel ideal for young couples and couple with one child. It hosts two of the six pools of the resort: one for adults and one reserved to the children, sun terrace area, bar and pool supervisor. Hotel I Ginepri is a 4-star hotel considered as the Family Paradise with reception, large swimming pool, pool-side bar and 175 rooms. Hotel Le Rocce is a 4-star hotel, smaller and welcoming, facing the pool, nestled in lush greenery, with its own reception, bar and 58 rooms. Hotel & SPA Le Sabine is a 4-star Superior with 94 rooms, set in lush Mediterranean vegetation, an "exclusive area" a few steps from the SPA and wellness centre, with large pool reserved to guests of “Le Sabine” and “La Duna Bianca” (pool in operation late May). Hotel La Duna Bianca is a 4-star Superior, a jewel, defined as "a personal terrace overlooking the sea" and offers its guests a special personalised welcome. All rooms of the Resort have a furnished veranda or a balcony/terrace, bathroom with shower, hairdryer, air conditioning, safety box, TV, minibar, beach towels. Hotel Le Palme Standard, Superior and Family rooms, with double bed (twin beds on request) + armchair bed. Rooms ideal for 2 adults + 1 child from 0-6 y. or until 14 y. in Superior. 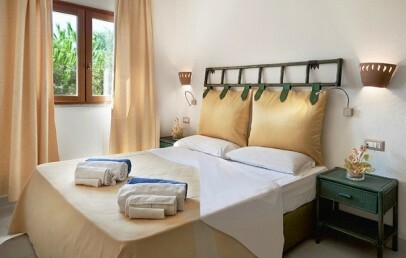 Hotel I Ginepri are set either on the ground or first floors, with double bed (twin beds on request). Standard – double room + armchair bed. Superior – double room + armchair bed + possibility of baby bed. Superior Family – 2 Superior rooms with connecting door. Family Suite – double room + separate living room with single built-in sofa beds (or armchair beds), 2 TVs, located close to the main service area. Senior Suite Family – one double room + second bedroom with two single beds + separate living room with two single built-in sofa beds (or two armchair beds) + possibility of baby bed, 2 TVs. Hotel Le Rocce breakfast is served at pool-side or, with payment of a supplement, on the room veranda. Superior – double bed (twin beds on request), armchair bed + possibility of adding a cot. Superior Family – are 2 Superior rooms with interconnecting door. 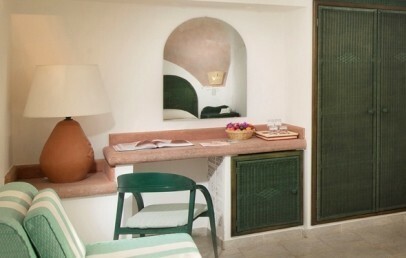 Hotel & SPA Le Sabine rooms marked by exclusive furniture and local handcrafted soft furnishings, ceramics and Sardinian natural stone. For adults bathrobes. Deluxe – double room and additional cot/bed for children from 0-2 y. Possible, only on request, to add a third bed for a child up to 5 y. old. 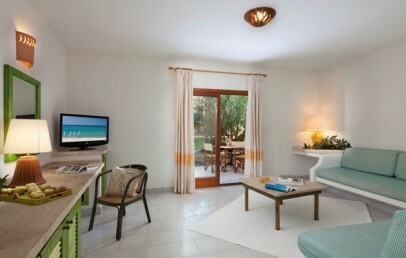 Suite – double room + separate living room with built-in sofa bed + one armchair bed, large bathroom. 2 TVs. Max. occupancy of 4 adults + 1 child 0-2 y. 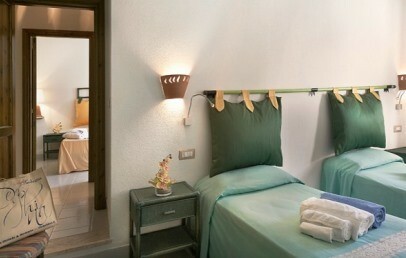 Hotel La Duna Bianca elegantly furnished rooms, spacious bathroom with shower (some with tub), bathrobes for adults. The beach is just in front. Breakfast is served complimentary on the veranda or at guests choice in one of the restaurant of the resort (buffet). Loungers + umbrella at the beach in reserved area. Complimentary entrance to the wellness centre, only for adults. Royal 2 – an open space double bedroom and living area, max. occupancy 2 adults + a infant from 0-2 y.
Royal 4 Sea View – same as Royal 2 but bigger with two armchair beds for 2 children from 0-14 y. President Sea View – an exclusive, spacious and elegant open space accommodation, double bed + living area, with two armchair beds and a extraordinarily spacious veranda offering a 180° view of the sea. Max. occupancy 2 adults + 2 children from 0-14 y. The Resort & SPA Le Dune opens onto the free beach of Li Junchi, a wide ribbon of white sand no less than 8 km long. The stretch of pure white sandy beach fronting the Resort & SPA Le Dune includes a reserved, equipped area with following services: bar, restaurant, toilets and showers, playground and nursery. The beach service including 1 umbrella and 2 sun beds from the 3rd row is complimentary. Prices for the 1st and 2nd row are: first row May, June and September € 16, July and August € 20; Second row: May, June and September € 12,00, July and August € 16. Complimentary for guests staying at Hotel La Duna Bianca in the exclusive area. The Spa at Le Dune Resort, Le Sabine Spa, is open 6 days a week. Upon reservation and at the cost of € 25,00 guests can access to the outdoor freshwater multi-feature swimming pools, Turkish bath, cardio fitness gym, relaxing and sunbathing area with sun loungers. PS: A self-certification of "good health" is required, to complete on-site before attending any kind of treatments and for use all facilities. Packages for pregnant ladies available excluding some treatments. 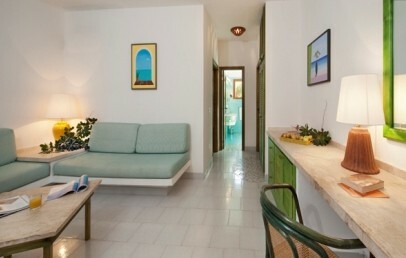 All adult guests staying at La Duna Bianca have complimentary access. The ideal venue for family holidays in Sardinia, Resort & Spa Le Dune has many services dedicated to children and teens, all guaranteed by the experience and quality of the Delphina brand. These services may be subject to change and are suspended on Saturday. Baby Club (from 2 to 3 years old) with free entertainment for children from 9:30 am to 6:30 pm. From 8:30 pm to 10:30 pm booking required, payment on site. A medical certificate (dated not more that 3 days before arrival) is required to certify that the child has no infectious or contagious diseases. Mini Club (4 to 8 years old) a whole host of entertaining and educational activities including the “Play & Learn” trail, where children can discover Nature in a fun way, from 9:30 am to 6:30 pm. Lunch and dinner with the teachers can be arranged at the "Peter Pan" Restaurant (open every day except saturdays). Junior Club (9 to 13 years old) from 9:30 am to 6.30 pm, includes a number of activities and sports, one dinner/theme party a week with the entertainment organisers (booking required). Teen Club (14 to 17 years old) with archery, five-a-side football, beach volleyball, mini basketball, tennis; non-alcoholic cocktails, dancing, dinners, after-dinner events and other special evening events. Reserved locations in which adults are not welcome! Thanks to the 10 restaurants located in different areas of the Resort, all with top quality guaranteed by the Delphina brand, guests can choose each day between a vast variety of snacks and aperitifs, show cooking, mixed grilled fish, light lunches, candle-light dinners, pizza or varied buffets offering international cuisine. One among the restaurant is the Peter Pan, reserved for the small guests of the Baby and Mini Club. The breakfast with buffet service is served in different restaurant according to the hotel. Hotel La Duna Bianca wiht room service, at no additional cost, or in any of the Resort's restaurants at guests choisce with buffet. Nautilus Restaurant is available to all guests for breakfast from 7.30 to 8 am. For dinner (19:30–22:00) guests need to book a table prior at the reception (booking not necessary for the Nautilus). Dining without supplement in following restaurants: Nautilus, Carrimbanca, Pomodoro, Alla Spiaggia and Li Junchi. Dining with supplement and to pay on-site at the restaurants: Scorfano, Il Fico d’India, Romantico, Il Leccio. Brunch Mediterraneo® from 12:30 pm to 2:30 pm served at the “Nautilus” or “Alla Spiaggia” Restaurant: light warm pasta buffet, the Chef's special cold dishes with cereals, pulses and vegetables, salads, fruit and local cheeses (no meat or fish main dishes and no desserts). The price is € 26,00 per adult, per lunch, children up to 14 years with special price. Guests who buy the "Brunch" for the whole stay and want to do some day trips in Gallura can take advantage of the Brunch Around offer available in some hotels (4 and 5-star) of the Delphina Group (a supplement may be applied). 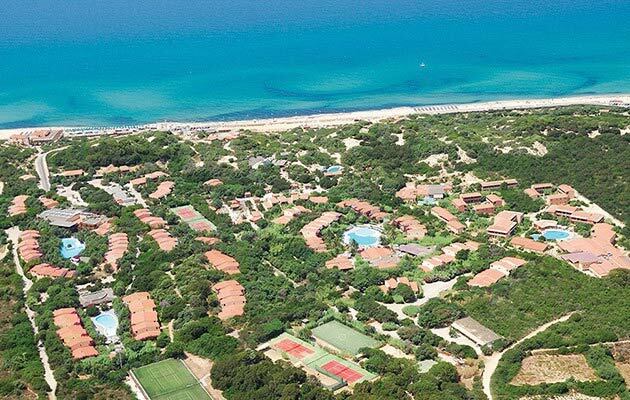 The Resort & Spa Le Dune has many sports facilities available free of charge, tennis, aerobics, dancing, fitness and jogging classes as well as guided walks. The Resort’s Amphitheatre has 4 tennis courts (2 in mateco and 2 in synthetic grass), a pitch for 5-a-side football, one minibasket and one beach volley court, archery butts (free use). The following external services are available for a fee: horse riding, diving, sailing school with catamaran and windsurfing, motorbike/pedal boat/boat rental, excursions. Various sports, entertainment and a wide choice of services for guests of all ages. Delphina organises great half day and full day excursions to discover the beauties of Gallura and the Costa Smeralda. All details and information can be found at the Dune Point. Within the Resort you'll also find the Customer Services Office, Diving Office, a games arcade, fashion and handicraft boutiques, news agent, OTC pharmacy and a photography shop. Wi-Fi connection in all receptions, at the bars Alla Spiaggia, Le Palme and I Ginepri, complimentary for the first 180 minutes. The Hotel’s Standard rooms, situated at the centre of the Resort & Spa Le Dune, offer a room with double bed (twin beds on request) and an armchair bed suitable for a child up to 6 years of age. These rooms all have a fully equipped veranda or a balcony/terrace, en-suite bathroom with shower, hair dryer, AC, safe, TV and mini-bar. Beach towels available on request (deposit required). The Hotel’s Superior rooms, situated at the centre of the Resort & SPA Le Dune, offer a room with double bed (twin beds on request) and an armchair bed, suitable for a youngster up to 14 years of age. These rooms have a fully equipped veranda or a balcony/terrace, en-suite bathroom with shower, hair dryer, AC, safe, TV and mini-bar. Beach towels available on request (deposit required). 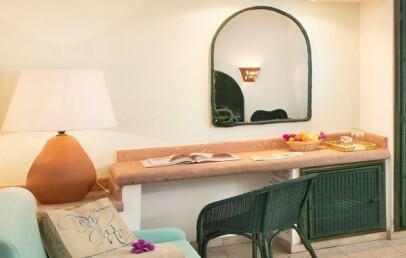 The Superior rooms are located in the vicinity of the resort’s main services. They have a double bed (two singles available on request), a sofa bed (for children until the age of 14 years) and the possibility to add a cot. 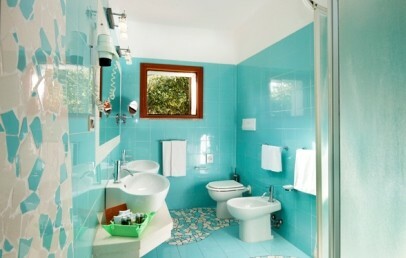 They have a furnished veranda or a balcony/terrace, en-suite bathroom with shower, hair dryer, AC, safe, TV and mini-bar. The Family Suites are located near the resort’s main services. They are are spacious and have comfortable furniture. They consist of one double room with a separate living room with single built-in sofa beds (or sofa bed) offering a total of 4 bed spaces + 1 cot. They have a furnished veranda or a balcony/terrace, en-suite bathroom with shower, hair dryer, AC, safe, two TVs and mini-bar. The beach towels provided on request, with deposit. 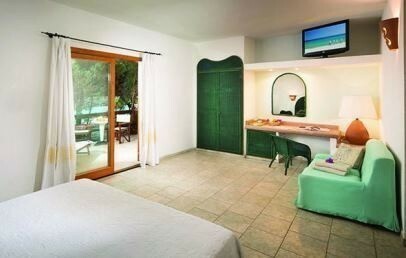 A spacious three-room suite, situated near the resort’s main services, with stylish and comfortable furniture. They consist of a double room, a second room with two single beds and a separate lounge area with two built-in sofa beds (or 2 armchair beds). They also feature an equipped veranda or a balcony/terrace, en-suite bathroom with shower, hair dryer, AC, safe, two TVs and mini-bar. Beach towels available on request (with deposit). The Superior rooms have a double bed and sofa bed (for children up to 14) and a cot may also be added. The rooms have a fully equipped veranda or a balcony/terrace, en-suite bathroom with tub or shower, hair dryer, AC, safe, TV and mini-bar. In the rooms are available bathrobes for adults and beach towels; breakfast is served at the pool-side or with a supplement in your room. 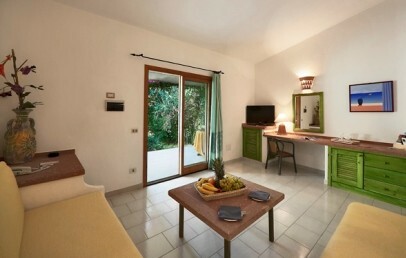 Two Superior rooms interconnecting, located in the vicinity of the resort’s main services. Each room has a double bed (two singles available on request), a sofa bed (for children until the age of 14 years) and the possibility to add a cot. They have a furnished veranda or a balcony/terrace, en-suite bathroom with shower, hair dryer, AC, safe, TV and mini-bar. The beach towels are available on request, with a deposit. Two Superior rooms interconnecting. Each of them has a double bed, a sofa bed (for children up to 14) and a cot may also be added. The rooms have a fully equipped veranda or a balcony/terrace, en-suite bathroom with tub or shower, hair dryer, AC, safe, TV and mini-bar. Breakfast is served at the pool-side or with a supplement in your room.